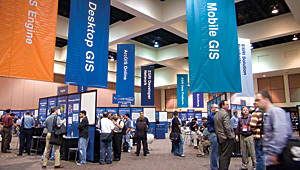 More than 1,200 developers representing 69 organizations in 49 countries attended the 2008 Esri Developer Summit, where they previewed Esri's next release: ArcGIS 9.3. They also listened to a keynote talk by Alan Cooper, who runs the software design company Cooper and is sometimes called "the father of Visual Basic." Said Scott Morehouse, director of Software Development at Esri, during the opening Plenary Session, "The primary objective of ArcGIS 9.3 has been to complete concepts and capabilities introduced at 9.2." "The ArcGIS 9.3 platform places a much greater emphasis on the Web," said Morehouse. "The technology platform for GIS has evolved over the years. Initially, the focus was on leveraging minicomputers and workstations with an emphasis on high-performance computing and end-user interactivity. Then, the focus shifted to the database with an emphasis on information modeling and transactional data management. Now, the focus is on the Web. We have been working to put the Web at the center of everything that we're doing with the ArcGIS system." A loosely coupled network architecture that allows different systems to interoperate in a federated fashion. Content. There's a lot of content, searchable and available on demand in a ready-to-use format. "We've put a lot of work into making content available for the ArcGIS system as a whole." Something easy to use. "I think people now have an expectation of simple access to information. They expect to be able to focus on their main job and not get stuck operating complex computer software." Participating in a larger ecosystem. "GIS is not a closed environment. It's a system that leverages and works with broader consumer, media, and enterprise technologies." ArcGIS Engine and ArcGIS Explorer were also discussed during the Plenary Session. ArcGIS Engine 9.3 will include improved dynamic display with better display caching. ArcGIS Engine also will include Microsoft SQL Server Express, allowing developers to use geodatabases stored in SQL Server Express as a data source. The plenary demonstration of ArcGIS Explorer showed some new enhancements to look forward to in build 480. These include multithreaded performance increases, direct connection to ArcSDE, GPX support, GeoRSS support, and improved task frameworks. The audience also received a glimpse of the direction of future improvements to ArcGIS Explorer, such as a new ribbon user interface. ArcGIS Explorer users will also be able to view maps in 2D or 3D modes. A pioneering software inventor, designer, and theorist, Cooper opened his talk with an anecdote about his experience, albeit limited, working with GIS about 15 years ago. "Jim (Barry of Esri) just handed me a T-shirt that says 'Geo-Geek' and I will proudly wear it," he said. His talk focused on how to solve what he considers the No. 1 problem in software design today. "It turns out that organizations that build software don't know how to integrate design from people who know how to do design," he said. "Management change is necessary to allow organizations that build and produce software to integrate the design processI call it postindustrial management." For example, he believes interaction designers should determine what must be built, design engineers should decide how software should be constructed, and production engineers should actually build the software. 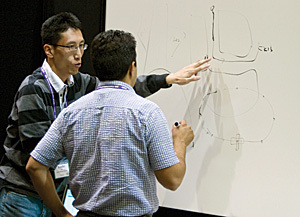 This year there were more than 40 technical sessions available to attendees, along with informal Tech Talks that followed. These focused sessions, which were well attended, provided best practices, tips, sample code, live demonstrations, and new features of ArcGIS 9.3. The Web ADF in ArcGIS 9.3 is a "hybrid development platform" that offers a well-balanced combination of client and server logic rather than only server. With the release of ArcGIS 9.3, it will be fully integrated with the Microsoft ASP.NET AJAX library. It will have faster map blending, more client-side logic, and support for Visual Studio 2008. ArcGIS Mobile 9.3 will include an out-of-the-box configurable application. A mobile basemap tool has been added so users can easily create basemaps that also support large datasets. To make generating a mobile map cache easier, a new tool has been added that lets users extract layers. Esri development leads, product managers, and senior-level directors hosted a question-and- answer session on the last day of the summit. That gave attendees the opportunity to ask questions and make suggestions regarding improvements to the conference, service pack updates, and anything related to ArcGIS products. People who were unable to attend the conference can download the technical presentations, audio/screen capture recordings, and sample code from the Esri Developer Network (EDN) Web site edn.esri.com/index.cfm?fa=conferences.gateway.